Indonesian cuisine is rich in spices and flavors, such as the ones that attracted Europeans to the country more than 500 years ago: nutmeg and clove. Rice (or nasi, in Indonesian) is present at every meal, including breakfast; and as you travel around the country, you will see the word soto, which means soup, a lot; goreng, for the fried dishes; and sambal (a spicy sauce that has several forms to be prepared, but it is commonly made with pepper, shrimp paste, lemon, sugar and salt), widely used to enhance the savory dishes. This post will give you a taste of the main foods you will find while exploring Indonesian gastronomy. Nasi goreng: I might venture to say that nasi goreng is the main Indonesian dish, found in both simple stalls on the street as well as in trendy restaurants. It is a fried rice with a more sweet and consistent soy sauce than the common (called kecap manis), vegetables and egg. It is served with acar - an Indonesian preserve with cucumber, onion and carrot - and you can find variations of the dish with the inclusion of red meat, chicken and seafood. Soto ayam: a chicken soup with very fine rice noodles, full of flavors and made with unique ingredients, the most striking being lemongrass, ginger, saffron and daun salam (known as Indonesian bay leaf). It can be served with white rice. 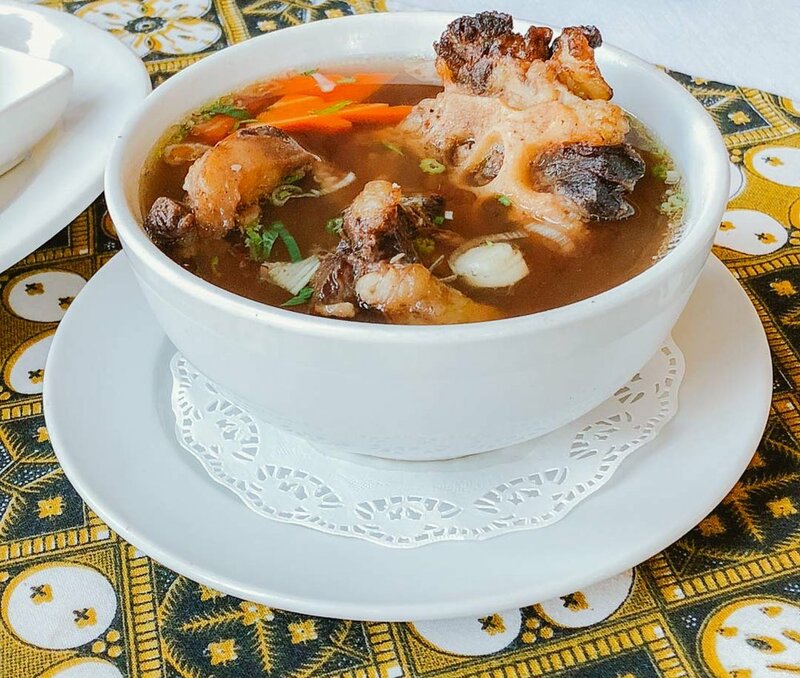 Sop buntut: an oxtail soup (in which the oxtail pieces can be either fried, grilled or boiled) with liquid base enriched with seasonings such as nutmeg, cloves and pepper, served with vegetables like potatoes, carrots, tomatoes and celery. To add even more flavor, put a few drops of lime on top and add as much sambal as you wish. Beef rendang: beef pieces cooked for hours in a sauce with coconut milk and spices - a mixture of lemongrass, turmeric, ginger and pepper - until the sauce is completely dry and the meat is so soft you don't need a knife. (In Indonesia, many people use their hands to eat, and when they need something to cut, they use only the spoon). 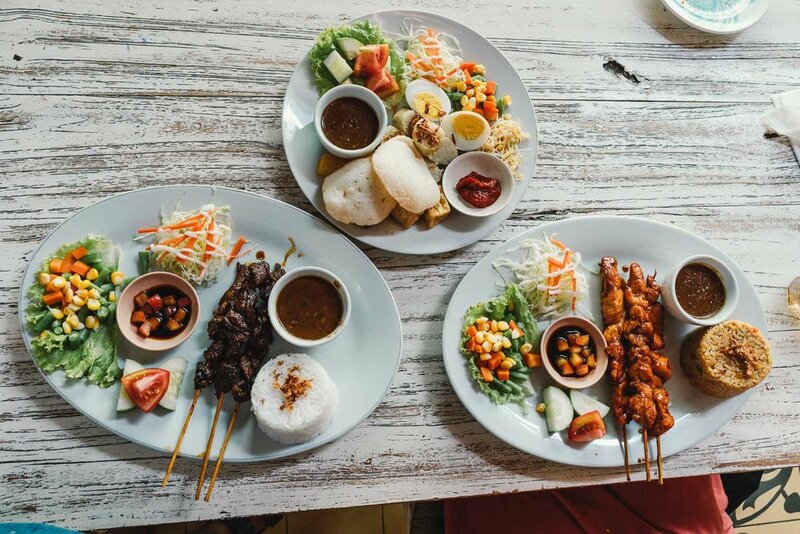 Satay: found in other places in Southeast Asia, such as Malaysia, satay is a skewer of chicken, beef or goat meat marinated in saffron, grilled and then served with peanut sauce. Gado-gado: a vegetable salad made of string beans, spinach, potatoes, carrots, corn and bean sprouts, and is also served with peanut sauce. Protein such as egg, tofu and tempeh (fermented soybeans) can be added. Ikan bakar: very common in coastal areas, ikan bakar is fish marinated in a spice paste grilled over charcoal and served with white rice, and more sambal. Mie ayam: a plate of noodles al dente fried with Indonesian soy sauce and chicken cubes; very easy to find in warungs (food stands, in Indonesian) scattered throughout the country. It can be finished with chives, some herbs and a wonton. Mie goreng: fried noodles with almost the same ingredients as nasi goreng (mentioned above). Soto betawi: a soup from Jakarta, capital of Indonesia, made with beef and a broth with coconut milk (can be accompanied with white rice). Ayam goreng: fried chicken with condiments that, after being fried, get crispy on the outside and juicy on the inside. Bakso: also found in several street stalls, bakso is super popular and consists of meat, pork, fish or chicken meatballs (or a peculiar mixture of all the meats) served in a broth with fried onion, boiled egg and possibly vegetables, noodle or thin rice noodles, and tofu. Gorengan: gorengan literally means fried food, and represents the fried snacks found on the streets of Indonesia that are very affordable; among them are cassava, tofu, tempeh and banana. Indomie, Pop Mie and other brands: found in any grocery, airport and even served on flights, it is nothing more than instant noodles, which is often eaten at any time of the day. After reading the description of the dishes, what do you think of Indonesian cuisine? Which of the above dishes would you eat?